This piano suite in 16 parts was triggered by an exhibition in Saint Petersburg with paintings of Moessorgski's friend Victor Hartmann, painter and architect who'd passed recently. All of his pictures discribed have been lost since, apart from a sketch for the Great Gate of Kiev. Transformation from piano suite to symphony was finished after the author's death. On April 4, 1866 Tsar Alexander II was almost assasinated in Kiev. 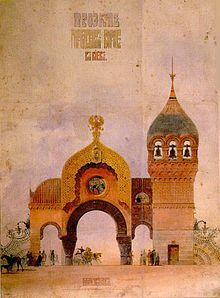 A big gate was about to be constructed on the site of the attempt and plans drawn by architect Hartmann already circulated when they were barred by the imperial censor.